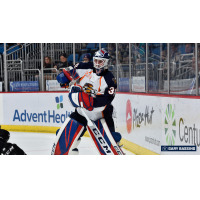 ORLANDO, Fla. - A goal outburst in the second period, led by five points from Michael Pelech and three goals in the second period led the way for the Greenville Swamp Rabbits. The Rabbits took the final game of a weekend set in the Sunshine State with a 7-4 win over the Orlando Solar Bears at Amway Center on Sunday afternoon. The Swamp Rabbits struck for two goals in the first period, three in the second period, and two more in the third. The three goals in the second period brought the Rabbits from behind by one to ahead by two when all was said and done after 40 minutes of play. Ultimately, Austen Brassard's goal at the 16:17 mark of the second period, proved to be the game-winning goal for Greenville on a lackadaisical defensive play by the Solar Bears that created a 2-on-0 rush. He was joined in scoring support by Thomas Ebbing on a neutral zone turnover, and Johno May, who posted two goals and an assist on the day. The Swamp Rabbits saw their first goal come in the opening minute of the action while shorthanded. With Trevor Owens in the box just nine seconds into the game for hooking, a steal forced by Chris Izmirlian started a slowly developing 2-on-1. Izmirlian's pass found Stephen Pierog waiting at the side of the net, and his one-touch wrist shot beat Corbin Boes and gave Greenville the lead. Orlando tied it four minutes later thanks to Cody Donaghey, who pounced on a Swamp Rabbits neutral zone turnover. But much like the night before, Greenville found response. Chad Duchesne set up at the left point, and waited for the perfect opportunity to fire a shot through. His floater whizzed through traffic and caught the top corner of the net to give the Rabbits a 2-1 lead after two periods of play. May and Pelech added to the Greenville lead after two periods of play, with May's goal adding insult to injury after a too many men penalty by the Solar Bears at the 1:22 mark. Pelech got help from May on his goal after replacement goaltender Hayden Stewart, who replaced Boes after the fourth Greenville goal, gave the puck away, and May fed Pelech who danced Stewart and buried the biscuit to cap the Greenville scoring. Orlando tied the score at 1-1, 2-2 on a goal by Otto Somppi, and took the lead on a goal by Mathieu Foget, but lost control of the game once Ebbing gave Greenville a 4-3 lead at the 15 minute mark of the second period. They outshot the Swamp Rabbits 39-25 for the game, including a 16-13 mark in a wild second period of play. Chris Nell picked up the win in goal for Greenville by making 35 saves. The Swamp Rabbits return to action on Thursday, December 13 and Friday, December 14 at home to take on the Florida Everblades. Tickets are available at SwampRabbits.com.